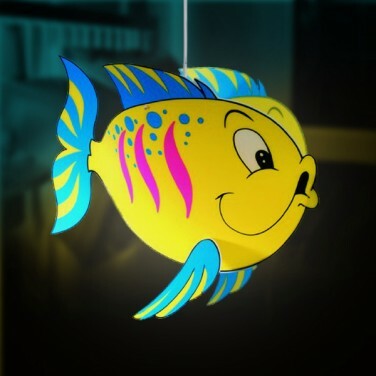 Help boost your child's imagination of underwater adventures with this attractive fish pendant light shade that can be hung from their ceiling, to create an instant fun light that conjours up tales from the deep blue ocean. Perhaps your child has a nautical theme in their bedroom or playroom, if so suspend the 'flounder' type character fish from the ceiling to add to the 'under water' theme. For use with a maximum 100w E27 bulb (not included) and measures 35x45x25cm. Please note for safety reasons this pendant light must be installed by a qualified electrician. Bring the magic of Neverland to your child's room with the stunning and detailed Peter Pan Ship Lampshade. Turn on the light and this outstanding pendant light will glow majestically with the promise of swash buckling adventures!